Online food delivery service Foodpanda is launching a partnership with WeChat across Southeast Asia. The tie-up will allow WeChat users to browse nearby restaurants, receive exclusive promotional offers and order food via Foodpanda. The partnership is now live in Hong Kong, Thailand, Singapore, Malaysia, Taiwan, Philippines, and India. WeChat powered by Foodpanda allows customers an order process similar to the Foodpanda website or app. After entering their location, users can immediately access a variety of restaurants and cuisines delivering to their area. The feature also offers a set of different cuisines or cities which customers can choose from. The app collaboration allows for payment of cash on delivery or via various integrated online payment options. 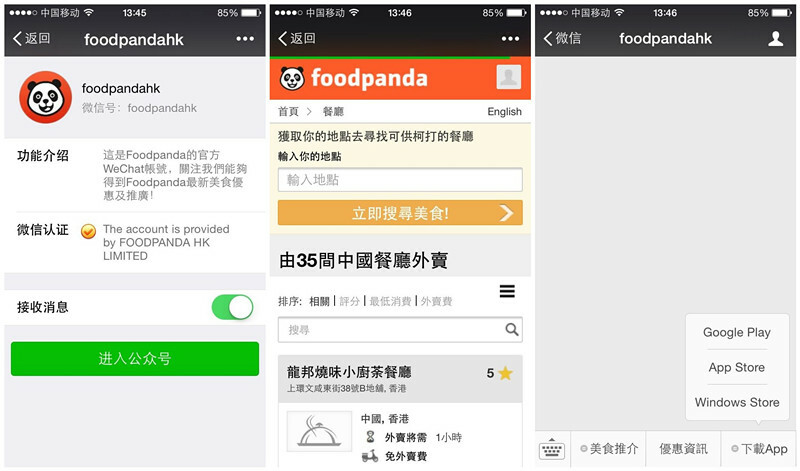 Users also can download the Foodpanda app directly in their WeChat account. To promote the service, Foodpanda provides exclusive weekly deals specifically for WeChat users and a 15% discount for customers that text “WeChat” to the service account, according to the company. With a population of 600 million people, an expanding middle class and skyrocketing smartphone sales, Southeast Asia has become a prime market in the rise of social messaging apps such as WeChat, which is looking to build a global presence. WeChat had accumulated 100 million overseas users as of August last year. Backed by German-based Rocket Internet, Foodpanda consists of affiliated brands of Hellofood and Deliver Club and has raised raised over US$100 million in funding since establishment in 2012. Zalora, an online fashion store run by Rocket Internet, also offers its services through WeChat.